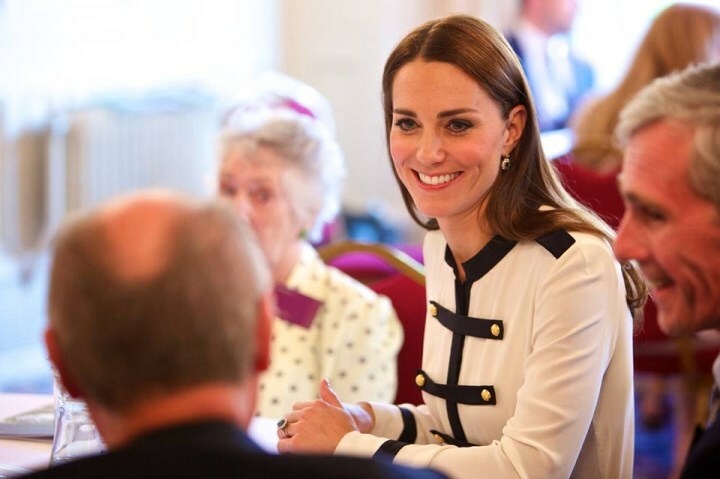 The Duchess of Cambridge visited Bletchley Park in Milton Keynes, Buckinghamshire today. Kate's visit marks the completion of a year long restoration project, which has returned the heritage and education site to its World War II appearance. This engagement holds a special significance for Kate; her paternal grandmother Valerie Glassborow worked as a "Duty Officer" at Bletchley with her twin sister Mary during the war. Records show Ms. Glassborow worked in Hut 6, as a civilian member of staff. 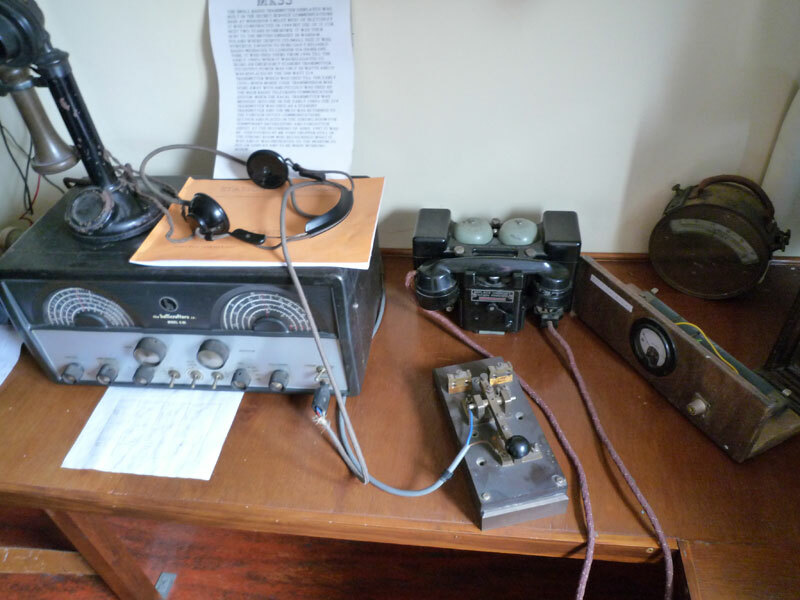 As with so many people who worked in British Signals Intelligence during the war very little is known about their work. Valerie's records were among many destroyed after the war. Below we see a photo of Valerie shared by the Middleton family, there's certainly a resemblance there. It must have been very interesting for Kate to see where her grandmother worked. 'Valerie and Mary were among the first to know the war had ended. 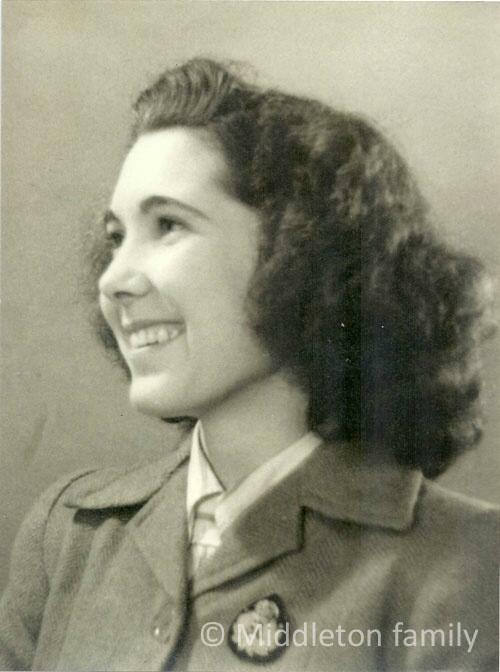 Lady Marion Brody, who worked with the Glassborow twins, recalls: "On 15th August 1945 Valerie and Mary and I and two other girls were on the day shift, which was rather fortunate. Mr Williams came in, he was smiling, he said, 'Well done girls, a signal's been intercepted from Tokyo to Geneva; the Japanese are about to surrender.' We just sat there, shocked into absolute silence. It was a great moment, one that I've remembered all my life." Valerie married RAF pilot Peter Middleton in 1946 in Leeds and they had four children including Kate's father Michael Middleton. Valerie died aged 82 in 2006 and her husband Peter died on 2 November, 2010 aged 90. William and Kate's engagement announcement was delayed because of his death. Kate was very close to both of them. Kate said to Lady Brody; "What an incredible story that you shared your time here with my grandmother. It's so moving for me, and to be here as well. I was aware of it when I was a young girl and I often asked granny about it but she was very quiet and never said anything." Escorted on a tour of the facility by Sir John Scarlett, Chairman and Iain Standen of the Bletchley Park Trust, the Duchess viewed interactive exhibitions and demonstrations before meeting the design and management team who delivered the project. The Duchess also met WWII codebreaker veterans who worked at the Government Code and Cypher School. Kate deciphering a morse code message using a replica radio that was used at Bletchley Park. As regular readers know, your faithful scribe more than enjoys researching the history behind these royal visits and today's location is a most fascinating one. In August 1938, the arrival of 'Captain Ridley's Shooting Party' at a mansion house in the Buckinghamshire countryside was to set the scene of one of the most remarkable stories from World War II. They appeared to be a group of friends enjoying the end of summer, even bringing a chef from the Savoy Hotel with them. But appearances were deceptive, the small group comprised of members of MI6 and the Government Code and Cypher School turned codebreakers. Their job - to see whether Bletchley Park would work as a wartime location. The efforts of codebreakers including Alan Turing, Dilly Knox, John Jeffreys and Peter Twinn is said to have shortened the war by two years. Kate must be incredibly proud of her grandmother and great-aunt knowing they served a role in this endeavour. Today, the stories remain a firm favourite among audiences. No doubt you've heard of the acclaimed TV series Bletchley Park or the upcoming Alan Turring biopic The Imitation Game starring Benedict Cumberbatch (a gentleman who has quite a few fans here :)) and Keira Knightley. Maintaining such a vital part of history is incredibly important for future generations to enjoy. The £8 million heritage lottery-funded restoration has seen more building work on the site than at any time since 1944, at the peak of war. The work carried out allows visitors to experience what it was like for codebreakers. Insightful exhibitions, a children's playground and a visitor's centre have been excellent additions, ensuring all ages can enjoy. Kate planted a tree to commemorate the visit and the completion of the extensive restoration project. It was a royal repeat for the Duchess today, who selected an Alexander McQueen military-style blouse and skirt she first wore in 2011 for a visit to Birmingham where she and William met local residents and emergency services who had responded to the riots in the city. Kate's Military Silk Georgette Blouse originally retailed for $1,355. It features gold button-fastening, button-fastening cuffs and a flared hem. The $995 Embellished Wool Crepe Skirt in navy is a versatile piece with gold anchor-embossed button embellishment. Both pieces are from the Pre-Fall 2011 Collection. 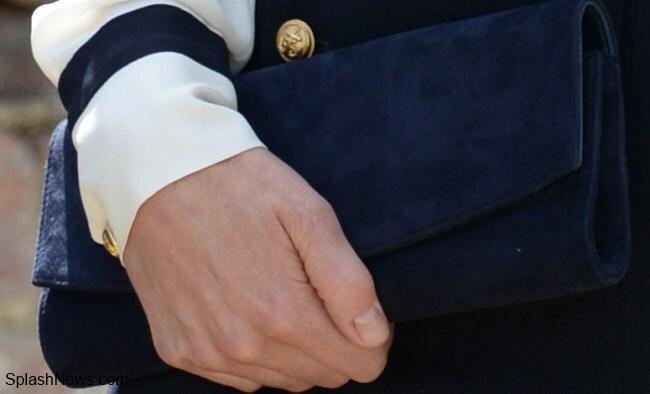 Kate carried her Russell and Bromley 'Muse' Clutch Bag. 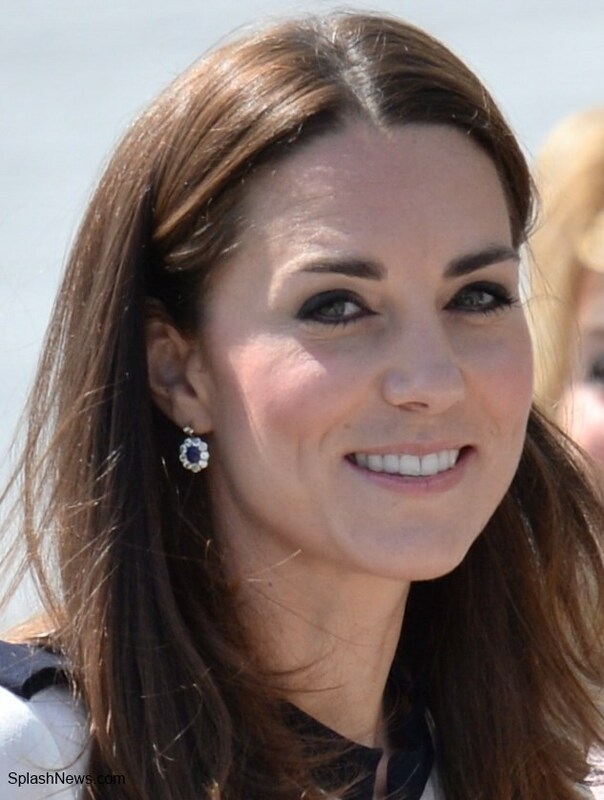 The Duchess accessorised with her sapphire and diamond earrings. Kate completed the navy look with her suede pumps. I thought it a wholly appropriate choice for today with the look's military theme, and from a sartorial perspective it's a very stylish ensemble. Professional, sophisticated yet chic and youthful. I was very much hoping we'd see this look again. Do you like it? 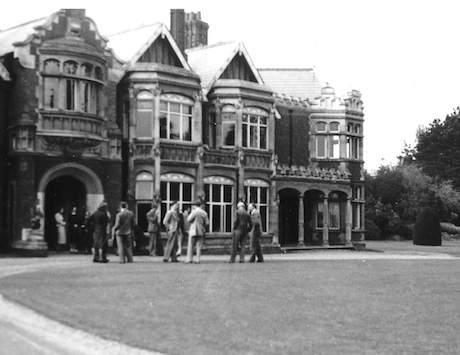 An excellent video on the restoration of Bletchley Park including a look at Hut 6 where Kate's grandmother worked. You can watch a video from Kate's visit at ITN Source. We have one other brief update to share. 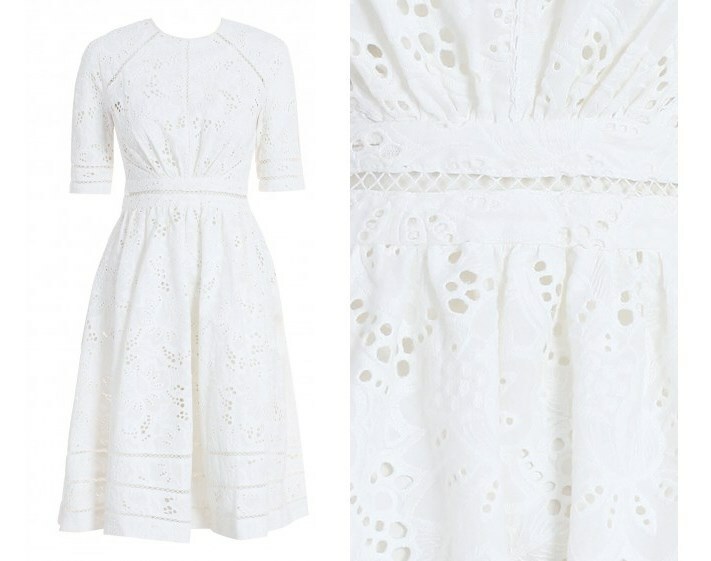 Kate's very popular Roamer Day Dress is now available on the Zimmermann website for $520. If your size is sold out do check back as they appear to be restocking and updating their website frequently. We've added links to the dress on our Shop Kate's Style page and will continue to do so as it becomes available at other online retailers. Kate does not have any announced engagements for the remainder of June, however, I'm not ruling out the possibility she may do something for Children's Hospice Week which ends Friday. Wimbledon begins on Monday and I'm sure the Duchess will enjoy a match or two! Don't know whether my previous entry registered as it suddenly went off! Loved this outfit the last time she wore it and still love it. It is classic and elegant, with a bit of a nod (albeit upmarket) of the navy skirts and white blouse worn by so many young women for work. I wonder if she knew of her Grandmother's war-time work---it was kept so secret until the last few years. It must have been a very emotional visit to her, nicely done. I love this outfit it is one of her best she has ever worn at least for me. Though I cant go past the heavy eyeliner OMG it is way tooo much. Her parting of hair does not do her any good, she constantly fiddles with it. I do not know when she gonna realise it would suit her better to style it differently. She has great hair but it makes her every move childish for me. I want the confident, stylish Kate back!! Great post on such an important aspect to the war. Very interesting video attached too. Looks like a good place to visit. I loved the part about Kate's grandmother - very cool personal touch that would have made the visit extra special for her. I have never liked this outfit of Kate's. I don't quite know why. I definitely don't like the buttons on her skirt round the tummy area. Its taken a while for this one to come back round though, and it hasn't become any more attractive for me this time. For Patricia USA - her earings I believe are half of a pair of Diana's that have been modified. Quite a nice touch for something so special to be passed down. Lets hope they have saved some nice pieces for Harry's wife to be. I agree about the outfit, kiwiNic. I like military inspiration like this, but I think it's a bit too much with the blouse and skirt. I think the blouse would look great with a plain navy skirt, and the skirt would look better matched with something without as much going on. I know they're meant to go together; it's just my personal taste. But she does look very nice, although a little wan. Thanks KiwiNic- that's what I thought too about the earrings and YES I hope there are some pieces for Harry's future Duchess too. 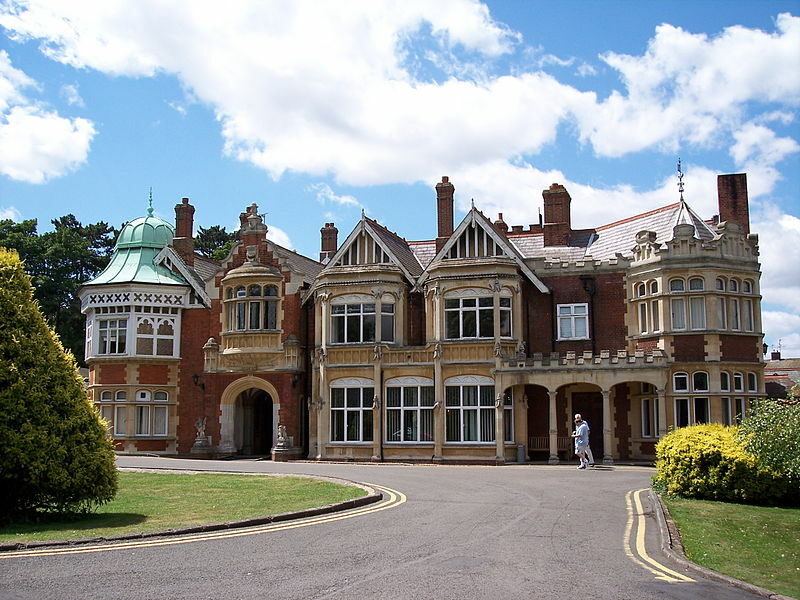 Bletchley Park looks like a wonderful place to visit. So much history in such amazing surroundings. So fortunate to have such a generous contribution to further develop the estate. An incredible amount of work and research has obviously gone into creating a terrific educational experience for all. Thank you Charlotte for all the interesting additional information. And how lovely for Kate to find the connection between Bletchley and her grandmother! I'm sure it would have made her visit much more special. I was expecting Kate to recycle today given the nature of the event; and although I understand the "military look" she's trying to invoke, I've just never warmed to this outfit from the beginning.Too many buttons happening especially on the skirt. I can't put my finger on what I just don't like about this outfit. 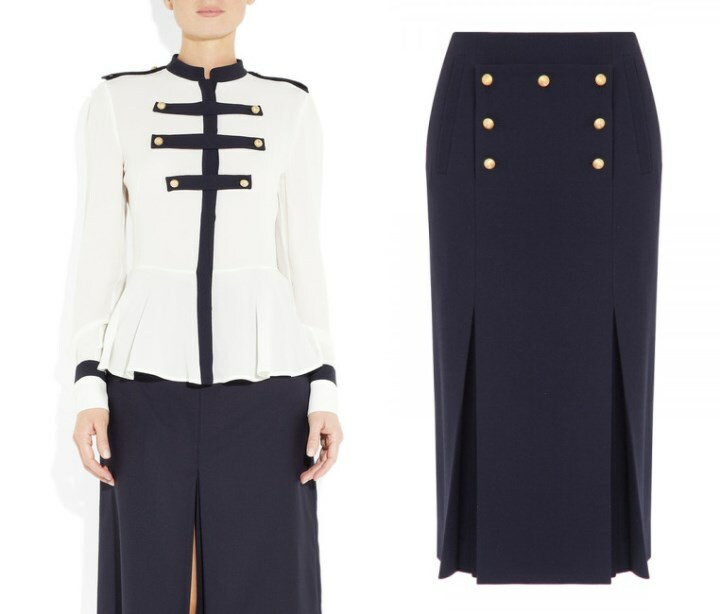 I would have preferred the blouse with the flare and a simple navy skirt as shown originally. Amazing history. Love when history is on the more personal level. Must have been amazing for Kate to meet those ladies who worked with her grandmother! Agree that there is to many buttons! An simple skirt paired with the blouse would look much better and highligt the blouse instead of the blouse and skirt taking each other out. Looked up that suit. Agree about your conclusion, but think it may be a to warm fabric. Just wanted to add that Lady Brody is gorgeous! I think so too! I would love the opportunity to sit and visit with her. I fear I might find myself tongue-tied at her beauty, however! Great story about her grandmother! And great that she'll draw attention to the site and the unbelievable things that happened there. Also that there's a upcoming biopic about Alan Turing. He's my idol. She looks beautiful! Perfect choice I think. But the long sleeves look a little too warm. But pictures can lie. Amazing to read about her grandmother! Must be a very special occation for Kate! Really, REALLY hope she will do something for hospice week. Seems a little weird if she doesn't! I'm with you on that Rebecca. I'll add some more "really's" to seeing some action for Children's Hospice Week. Despite it being such a busy couple of weeks for Kate, this would prove the level of commitment she has towards her charity. Hospices seem to be her main focus more recently. Even a pre-recorded video of Kate discussing their work would be enough to satisfy many. I think she did something similar a couple of years ago. Don't know why we don't see more of this type of support more often. I hope so, too. A summary of her visits in video form with a message about sharing best practices would be nice, I think. Good that we got the post above! I was afraid she wouldn't do anyhing! Charlotte-beautifully researched and written about an astounding effort made by so many during the war. It must have been so incredibly poignant for Kate to reach back into time and touch the history that her grandmother and great aunt (?) made--and how proud of them and all of the others unvolved! It is So important that those of us who are enjoying life in free countries learn and appreciate what so many others had to do to keep us all that way! Kate looked lovely and very smart and appropriate. Hi, Patricia...how was your big birthday!!? Terrific, I hope! Good morning JO- yes my birthday was amazing- all thanks to my wonderful husband! thanks for asking. Beautiful turn of phrase, Jo. Today really was about reaching back into time, wasn't it? I hope the official re opening allowed many whose work there was so vital to the effort to reflect on some happy memories as they were honored for their service. Summer--a compliment like that from someone of your stature and experience has me struggling to keep my ego in check! High praise, indeed! Thank you so much. not my faorite outfit, but considering the nature of the event I have to agree with Helen. I also think she got way to thin (see this photo https://twitter.com/ClarenceHouse/status/479209028346986496/photo/1). shame, I liked her more with some meat on her. She is thin, yes. But I think that's how she is built. She has very defined muscle tissue that shows that she is working out. If she was starving herself in some way her body would start "eating" up her muscles. She is athletic and has a highly energetic kid. She reminds me of my neighbour in that regard. After pregnancies her fat just disappears when she breastfed. She was thinner after birth than before her pregnancy and had to fight to keep her weight. Rebecca, I totally agree with you. I love her choice of the McQueen military style outfit which ties in perfectly with the engagement, Bletchley Park, important piece of WWII history. Agree Rebecca, it's not uncommon for mothers to lose weight the way you described it. Catherine is obviously a very fit woman. I agree with you 100%, Polly. We go so far out of our way to accept, and not "offend" those that are overweight, but for some reason, we see nothing wrong with shaming people who are naturally thin. Kate might be naturally slim, but you can tell by her muscle tone and definition that she also works out, and is indeed...very healthy. My mom has a thyroid problem and has always been overweight, so I totally understand how difficult it can be to lose weight when faced with a medical issue, but I think for a lot of people (both men and women), being overweight is a result of eating the wrong things and not making the effort to get some exercise. Money and time shouldn't be an issue either. I'm not wealthy, and I have always worked full-time, and I always managed to choose healthy foods and take a walk every day. Now, I am also one of those people who was slimmer after my pregnancy, and I remember some women being rather insulting towards me because I "dared" to be thin after my baby. Almost insinuating that I was neglecting my child so I could go work out and be skinny. I can assure you that wasn't the case, As much as we feel we should be accepting towards people who are overweight, why can't we extend the same courtesy to those of us who are either naturally thin, or who work very hard at keeping the weight off and trying to be the healthiest person we can be? Laurie--whenever someone loses weight and achieves an attractively small size--and is criticized for it--it is insecure jealousy, pure and simple. Oh wow Charlotte, what a great post, interesting history and so special for Catherine. I love the outfit, very classy! Will definitely watch ANY movie w Benedict C, he is my favourite! Interesting. I have always thought she took after her mom. But she is a dead ringer for her paternal Grandmother. Funny how genetic goes. Like the skirt. Like the top. Don't like them together. Too costume-y. Agree. LOVE to look at genetics. So interesting to see what people have got from who. Funny, I've always thought Kate favored her dad's side and Pippa favors Carol. Great post today. This is my first time posting in a while. Unfortunately my older brother passed away. And haven't felt too much like doing much of anything, but I've still been reading your blog. I always liked this outfit. I thought it was very chic and not dowdy like some of the other choices she's worn. A lot of her clothing choices after she and William got married were a lot more bolder I feel than now. I do believe she was taking advice from some kinda stylist. Blair, I'm sorry to hear about your brother. Take time and be good to yourself. So sorry to hear that, Blair. Good to hear from you. Keep in touch. just fine! You'll get through it---not over it--- through it--and you'll be all right. Bless your heart. I'm sorry for your loss, Blair. Deepest sympathies about your brother. Thoughts and prayers are with you. Take care! Blair, I am so deeply sorry for your loss. My condolences to you and your family. I often feel I know so many of you through your comments and conversations, it's terribly sad to hear you've lost your brother. Blair, such unhappy news. We can never be prepared for events such as this in our lives. Just take our time to heal, grieve and continue to keep our beloved's memory in our hearts. Hope you come to that accepting, peaceful time soon. You have all our kindest thoughts with you. Blair, I am so sorry for your loss. Deepest sympathy to you and your family. Oh Blair, I'm so sorry!!! It does take a long time to get used to the idea that someone is really gone, to deal with the huge void they leave, and to feel like doing anything. I know we are all thinking of you and sending our thoughts from all over. Thank you all so much for your kind words and sympathy. I honestly cannot express how much it means to me! Thank you thank you again for such a well-written blog that includes the history and the fashion! Love this site!! :) I agree with the other commenter who said the outfit is a bit too costume-y. I get the military-inspired connection as her reason for wearing, but both pieces together are just a little too much IMO. And I agree that the eyeliner seems harsh, and would love to see her with more half-up hair styles again instead of the harsh parting. Still, she's lovely and I just love her style which is why I follow your blog LOL Thanks for being so quick to post things in real time! The makeup is so harsh! She's gorgeous but I wish she would lighten up a bit. I actually have a couple of minutes so I can comment! I like today's look but, the more that I look at it, the more I think that I like the pieces individually more so than when they are put together. That being said, I think that Kate looks nice. Her hair is something to behold! Seriously! I know that some people are irritated when she touches it a lot but the picture of her walking toward the camera, when it is blowing away from her face...wow! Her hair was definitely working for her today. Now that eyeliner...it is a bit heavy for day time but it doesn't take away from her beauty (in my opinion). I thought she glowed today. Charlotte, thank you for the quick history lesson; I am fascinated by the code breakers...as a history buff, I want to know even more--I'm going to look for books on the subject tonight! Thanks for an awesome post. I'm looking forward to checking in and reading everyone's comments. Love this post Charlotte and Kate's outfit. I may be in the minority but that's okay. I love the nod to the military and that she repeated so her outfit was not the main topic of conversation about her visit. Although for us, it probably will be! I LOVE, LOVE Benedict Cumberbatch! I have only seen him in Sherlock, but that is enough - he is AMAZING. <3 <3 <3 :) Also, that looks like Allen Leech (Tom Branson in Downton Abbey) in the Imitation Game. And Keira Knightley!!! Three amazing actors ;) Great post, I love her outift, and great backround! Thanks! Yes I absolutely ADORE this outfit on her. It look youthful, sophisticated and professional at the same time. I love the slits in the front of the skirt! Is she looking skinnier than usual or maybe it's just me? I love th epicure of her grandmother. You can definitely see the resemblance. I am a huge WW2 fan and have seen the Bletchley Park series. If/when I finally get to visit the UK this place will for sure be on my list of must sees! The front of her skirt with all the buttons look like the pocket/flap in the back of those onesies/pyjamas. Good luck looking at that skirt again everybody! We in the USA have a story about wartime codes---the Navaho Indian Codetalkers sent vital messages back & forth that the Japanese were never able to translate. The last surviving Codetalker passed away recently. ALSO--did anyone read that The Queen made Hilary Mantel a Dame at her Birthday Honors---the woman who specializes in insulting the Royal Family. Maybe the award was meant to be forgiving....but I was amazed that she accepted it!!! ALSO AGAIN---Day one at Ascot --lots of Royal ladies showed up in Guess What--pale blue!!! Everything looks different from the inside looking out. She accepted the award. She's an insider now and will look like a huge hypocrit , if she continues. her criticisms. Maybe that's the point: keep your friends close; your enemies closer. to become a Dame--that it "means a great deal to have my efforts recognized" and that it is "not so much a reward for the past, more as encouragement for the future." ---So maybe she is thinking along the same lines! Marg- Interesting point you made there. The Queen is a savvy woman so I bet you are right. Or, perhaps HM's famous sense of humour is at work? and Marg's excellent "enemies closer" insight is added bonus? One thinks it may be a case of chicken or egg? Pandora- I can't imagine HM using her Dame award as a joke, but I doubt she failed to see the irony. Think we sorta meant the same thing. It really is so, so important for the young royals to meet every possible World War II era citizen–they won't be with us much longer and the Royal Family is instrumental to furthering the history and memory of wartime Britain. Thanks again, Charlotte, for a great post. I still love this look and have been waiting for this one to be worn again. Yes, it's a bit costume-y, but totally appropriate for the occasion and visit. The Duchess looks gorgeous! Thanks for another great post and for the history. You are amazing! This outfit has never been a favorite of mine. I think it's the blouse. I love Kate and think she usually looks gorgeous. Today she looks off....different. Her makeup looks very heavy and she looks much older than she did just last week at the garden party. Had to get that out of the way. Also, in repose, her face-eyes especially, indicate pain of some kind to me. Let. the botox rumors cease. The outfit- this is classic Kate to me. Agree the top and skirt together, perhaps a bit much. But her hair is GORGEOUS! Heavy on the eyeliner, but maybe she is trying to compensate for her tired/ pained eyes. However, when she smiles, everything is forgiven. Charlotte, fascinating copy! Shows a lot of work and thought and I thoroughly enjoyed it. How great that the floors, furniture - all seem to capture the essence of what was there. Can't wait for the movie. There have been a number films, tv programs, and books written on this subject. There was a British BBC? series I watched on DVD . Of course ,I can't remember the name- but centered on the umbillical cord tie between the (mostly) women wearing those head-sets and the incredibly brave workers broadcasting from closets and hay-lofts in France in code, sending crucial strategic information about enemy activities. I realize that may not have involved the women at this site specifically, but ambiance is similar. I think Catherine has a bit of her Grandmother's dedication to purpose. Her Grandparents certainly "did their part," as many did in the UK, with her Grandfather an RAF pilot. Thank you for another really interesting post. You're the best! I don't really see the resemblance of Kate to her paternal grandmother. The one who really looks like her is Pippa! It's quite extraordinary. It seems that this grandmother did live long enough to see her granddaughter dating Prince William. That must have been quite astounding for her, coming from a time when the Royals didn't "mix" as readily-excepting George VI and the Queen Mother in the Blitz, etc. when they reached out personally to so many citizens. I like Kate's outfit, especially the skirt. It suits her very well, accentuating her willowy figure. Unfortunately, she rounds/slumps her shoulders often-something I've noticed as a problem for many tall women. They seem to want to counteract their stature sometimes; maybe due to self-consciousness about being taller than some of the people they are meeting. Strange because Kate loves her heels which boost her height. I hope Kate stops to think of how blisteringly proud her grandparents must be of her! I hope Michael Middleton feels the same about his extraordinary family. I'm working in a professional environment part-time for the summer and I've been wearing heels and noticed most of the other ladies are too. However, there are exceptions and flats are becoming a little more popular but compared to other cities I would say, a larger proportion of professional women do. It's all about finding a heel height and style which works best for you, comfort is really key. Canadian friend, I agree about Catherine slumping her shoulders but I have noticed so many of the younger generation doing that. It brings back memories of being told to walk around with a book on my head and to "straighten up". Maybe younger women are just not told that anymore? I liked the look and I am glad that Catherine had an opportunity to go down memory lane genalogically. A great boost to Bletchley Park too I imagine. Watched the first season of Bletchley Park but couldn't get into the second one. I agree about the posture Canadian friend; in my day we were constantly reminded to "straighten up" but I don't think young women are anymore. Oh well, Catherine is still lovely and it must have been exciting for her to see where her grandmother worked during the war. Bletchley Park was on the ball to contact her and get her on board for their event. I remember trying to walk with a book on my head...but it kept falling off and I thought I had a strangely-shaped head! But I wanted to have good posture and, inspired by the way The Queen was taught, I learned to sit up straight and walk as tall as a 5'5" person can....and books STILL fall off my head! By the way....if any of this comment is in another language, a new key has suddenly appeared on my screen that changes languages--and I hit it accidentally---the Z and the Y switched places and I thought I was losing it!! Thanks Charlotte for a well researched post. Code breaking has always fascinated me, and when me and my sweetie come to the other side of the pond next year I know I will have no problem talking him into adding Bletchley to our itinerary. I loved this outfit the first time she wore it, and my opinion on it goes unchanged. Not happy that the heavy eyeliner seems to be back, though. Blech. Have a wonderful day, everyone! Bitchy comment alert. I find it irksome when someone dresses up to invoke military - when they actually aren't. When you visit places with military history do you think to yourself "I should wear military inspired clothing!" Or do you just put on a nice day dress/outfit and get on with it? I agree with the person who opined that this is very "costume-y". Most of us have family who have participated in war efforts - we don't dress like that when honoring their contributions and visiting historical sites. You would not see anyone wear something like that at Pearl Harbor. Of course that is American way of thinking. Someone from Britain will have to tell us if that is a British way of dressing themselves for touring historical sites or if it is just a Kate approach. I don't find it irksome or costume-y. I think a nod to the military is a sign of respect. to the people and places they visit. About the outfit-- mainly she looks lovely but the severe bars on the blouse are, to me, over-powering---dominating, even. One thought sbout the heavy eyeliner--I wonder if the intent is to keep the attention from the little pouches under her eyes? My husband is currently active duty military in the United States and he, along with many of his brothers in arms, have no problem with something like what the Duchess wore today. In my experience it is when someone wears the U.S. flag that many are up in arms about it. The skirt is lovely with a touch of something you would see on old fashioned uniforms. It isn't camouflage print or anything such as that. I live in a military town and people pick up old uniform pieces at second hand stores and cute them up and wear them in odd ways. To me that is disrespectful. What the Duchess is wearing is more just a tip of her hat at the community or place she was visiting. Your correct Moxie it is a bitchy comment. But that is nothing new for you. You never have a good thing to say about Catherine. So why do you even visit this blog. Actually, anon 06:02- YOUR comment was more offensive to me than Moxie's, because she left the door open for other ideas. YOU'RE making a remark about someone that includes the word "never." Tricky word, "never." If I told you I was working on my doctorate about the presentation of female images in the media, particularly royalty and their use of symbolism to suggest power and authority - would that be a good reason to participate here? That one can track Kate's co-opting of military style to help her fit in with her in-laws consistent deliberate use of demonstrating "military might" through parades and exclusive orders (Trooping the Color and Order of the Garter) when they don't, in fact, actually control the UK military. I'm not working on a PhD - but if I did, that would be it. Why are you here? What is Kate doing for you? Oh, Moxie! Power and authority? Military might? With heron plumes? Even if the Queen were flexing her military muscles under her velvet robe, Kate and William could barely keep from laughing out loud. I enjoy you , Moxie. There is always at least a kernel of truth in your posts. Trooping the Color is a padgeant for tourists, although a bit of an anachronism. That Ph.D. sounds like a plan for you. Whatever you are doing, you are being wasted. Why I'm here , Moxie, is because since the age of five, I have been inspired by royalty in terms of leading by good example and being a symbol that points to the best in what a country and what its people stand for. I don't know why those things are so important to me---and have been since I was little--but they are. The same goes for a love of ceremony, history, fashion , and animals...and beautiful gardens, architecture , and interiors. Maybe I was a strange kid...but much of what I love seems to find happiness in my interest in the royal family, even if others don't understand it. That's OK. I have also come to love the fun and stimulating friendships with others the world over who both share interests and differ in them. sometimes so angry and hostile . Kate seems to bring it out---and things military ad well. I think that your assessment of royal military might demonstrations forgets that royalty honors the military on behalf of the entire country...honoring its defense of the country and the extreme sacrifices that go along with that defense. Remembrance Day isn't a demonstration of might..it's leading the country in honoring and thanking members of the military. Do you have some experiences that are related to the military that have left you angry, if you don't mind my asking? I only ask because it seems to be a topic about which you feel strongly enough to post very angrily. The first time Kate wore this outfit I did not care for it, and the same is true for me this time. It overwhelms her in a way, because there's so much going on in the front. I certainly understand why she chose it for this outing, but it is my least favorite of anything from her wardrobe. As much as I love her hair, I think she needs to cut it some and style it in a way that she doesn't always have to pull it away from her eyes. The buttons on the skirt are a bit much, but she is so thin that she can carry it off. I did love the slits in the skirt, which add youthfulness and style. Fascinating history, than you Charlotte! I agree about the buttons especially on the blouse,, i think it shouldve been on a blazer instead of buttons dangling from the blouse. The post was such an interesting read!! Thank you Charlotte for this informative post, I never was aware about Bletchy Park and its history.and Kate looks just like her gramma IMO. Just saw that there is a part 2 of the ITN video. Such a cute part with Kate and the lady who worked with her grandmother. Such a touching moment. Kate is so great with the old ladies!! What a special (personal) engagement for Kate. I like this outfit very much (I have always been fond of military looks), but I have been hoping to see the blouse worn over the skirt, like the model above. Love the outfit! Total win, both times she has worn it. It is super stylish and classic. Disagree with all who say there are too many buttons - heavens no! :) This style of McQueen and the DoC are the very best of friends. Actually the 2012 and 2012 McQueen collections that Kate has worn have let us see her at her most quirky, I think. Fabulous. OH. MY. Goodness. Kate + Benedict = HAPPINESS!!! I'm stuck between a rock and a hard place, or rather between a heavy application of eyeliner and too many buttons. Kate has often been applauded for not needing a stylist or dresser, but I think sometimes she needs one. That shirt and skirt combination is just too many buttons and comes across exactly as we've have already said: costume-y. Also, I hate to see her return to her stage makeup. I feel that she wears it so her face won't get washed out in the photos, but this is the era of long lens photography. They could take a picture of a pore on her nose and get good quality. That all being said today's engagement was actually kind of special and interesting. It's great to see her reaching out in a personal way. I imagine we will see her at a hospice later this week. On a last note I wonder if anyone else is in the same boat as me and feeling a bit bored of Kate's fashion lately. I mean, I still adore her and she basically wallpapers my desk at work, but there's nothing really fascinating happening here with fashion. Pretty blah. The Queen always seemed to make an effort with incorporating modern trends. There was an article written by Richard Palmer and I believe it was in the express that Charles does not want to continue to pay for Kates clothes. He is the one that pays all their expensnes not the taxes payers. So I think that is why we are not seeing alot of new dresses. But Kate has always re-wore her clothes which is great. I am not even goin gto address the eye make up. Everyone one has their own opinion. I thibk she looks good. Who knows why she applies it like she does. I do agree with you Nicole. But then I ask myself, 'who said she has to be a fashion clothes horse?'. Its just all our warped expectations....sigh. The thing is, she's not there to please our cravings for novelty. I loved watching The Bletchley Circle, so glad Kate could meet some of the ladies from her Grandma's generation. "In a dots and dashes Morse Code-style Alexander McQueen dress, Kate listened to Lady Body describe the work she did with Valerie as they stood in the same hut the women had worked in." Fantastic post today! Thank you for your research and photo selection. Richard is my favourite royal correspondent Summer. He's incredibly helpful and offers a measured, realistic view in his pieces. Thrilled to hear this about him! He is a great friend to the British press, too, no doubt because his colleagues view him as you do. His column last autumn on press freedom was exceptional, I thought. I love Richard Palmer too! I follow him and also Charlotte on Twitter and that's all I need as far as Kate following is concerned. When I first saw this outfit, I loved it! Now that I read all the comments about it maybe looking too costumey, I see their point, but I still like it. Guess I like costumes! :) And I love how Richard Palmer saw the dots and dashes in the dress. Very insightful. Now, on to research Lady Brody, etc.! Charlotte, thanks for all the history. I hope you find some exceptional pieces written about her, Victoria, or at the very least some great biographical information. Please share, if you do? Summer, I hit a complete dead-end searching for any information on Lady Marion Brody. I hope others have better computer sleuthing skills than I do! The only info out there about her were articles about Kate's visit to Bletchley. I'm a little surprised and disappointed not to be able to find a single thing. Oh, well. Victoria- she may have had information removed, in advance of all this publicity. I would enjoy hearing more about this seemingly feisty, brave woman. There were so many years- at least 25!- they had to keep silent. It may be that some people and information are still protected. There were 10,000 workers in this field! What a feat to keep silent as long as they did. I was amazed at the Duchess and her grandmother's similarities, too, Bluefire! Bluefire--Your posts are always SO full of love---Wonderful! They make me happy every time I read them! We are each a unique petal in a lovely flower! I have multiple sclerosis and my pain levels vary from day to day. When I am having a particularly hard day I have noticed that I add more eye makeup to try and cover the pain in my eyes, or the bags underneath. There have been a few events recently when the Duchess has looked less than her usual self. I don't know if she is ill or just under a large amount of stress but she might be add more makeup to try and distract others from noticing anything else or maybe it makes her feel better. I sometimes joke on bad days that my makeup is my war paint. I put it on to face the world even though I would rather not. I know that it is easy to look at her life and see all of the special treatment she receives and all of the opportunities she has but as someone who suffers from "an invisible illness" and often times you can't tell something is wrong with me I have learned to never judge someone unless you have walked a mile in their shoes. Who knows what is going on behind the scenes. We don't. For all we know she could have some chronic issue they don't want publicized or her little man might be a very high maintenance little guy. She could just be lazy and selfish but I don't see that and not knowing all of the details makes it impossible for us to say. We all have our burdens to carry, and some of us more stoically than others. I'm sure Kate has days which are not a bed of roses. Being privileged/wealthy does not ensure everlasting health or happiness. I too suffer from a chronic illness (sounds like a common link between some of us here). The last thing I would do is highlight my eyes with heavy eye liner. More likely to conceal the bags and circles or cover up with glasses as they look terrible. I see more weariness in Kate's face. She's lacking the "freshness" I usually associate with her. She looked incredibly happy and energetic at the polo match on Sunday - not something you'd expect to see from someone unwell. I'm inclined to putting it down to maybe not sleeping well? But seriously, we're not ones to tell or judge. Courtney-- wonderfully well said. We truly don't know what is happening in her private life--or her official life either, for that matter! Thank you for letting us know what you are going through and what it takes to go through it. It may be helpful for you to share --and that helps us to understand and learn. We are a pretty caring group and we are pulling for you! Courtney, you're very wise and brave. I'm ashamed of myself for not thinking of this possibility. I do the same, though not with eyeliner, but rather foundation product. Hoping you get an abundance of days when you don't have to be anywhere but at home just taking life at your own pace, too. I also hope you have an outstanding neurologist and other specialists and that your disease is well controlled for the time being. And scores of understanding and helpful family members, friends, neighbors and others surrounding you. Distractions are so helpful, aren't they? Stay strong and keep fighting. I suffer from a chronicle disease as well, and I do exactly the same with my make-up. I'm also keen on astrology - Kate's May and June are burdened with all kinds of difficult planetary positions, which account for lack of energy and hard times. Courtney--you brought up a lovely memory from long, long ago when you mentioned "warpaint!" My beloved Mother, despite her awful problems with alcohol, was so funny and full of love---and she called make up "warpaint" too! Courtney Thank you for sharing your story with us. But not to sound cold (which I am not) now everyone will start to think Catherine has an illness and that is why she wears heavy make up. I do not believe that is her reason. I believe she likes it that way. If we look in the past she has always wore her make up that way. And maybe Prince William likes it that way too. Helen-05: 06- re: "happy face" In my earlier comment, when I spoke of the possible pain in Kate's eyes and the use of heavy eye make-up, I spoke of Kate's face in repose. If you study the Bletchley photos, you will note that when attention is focused on her, she makes an effort. There are also shots of her face that reveal something else- not just absence of Botox i.e. "freshness." As far as the polo photos showing her with a happy face, and therefore she can't be experiencing pain of any kind- what mother hasn't put on a happy face around her children? During some of my most difficult times, I tried to at least act happy for them. Of course, we kid ourselves, because they know, at least on some level. Thank you for sharing, Courtney. My mother-in-law suffered from MS. I know that there are varying degrees, and unfortunately, hers was extremely debilitating. I never really understood what it was until I met my husband, and got to know his mom, and I now know just how painful it can be for those that have it. You will be in my prayers, and I certainly hope that you have many more good days then bad ones. Lovely perspective on Kate's life...it's very true that we will never truly know what it's like for anyone else until we walk a mile in their shoes. It might appear that she has everything and will never want for anything, but she's still human...she has feelings and gets ill just like the rest of us. We'll never know if she might suffer from some sort of chronic illness, and truthfully, it's not really any of our business. I'm sure there are days that she would just rather not get out of bed. For all the privilege she enjoys, I'm sure there's also a price to pay for it. Courtney - both your posts are beautiful. I am in awe of your spirit and sense of perspective. I thought the Duchess looked lovely and appropriate today. I hope HRH's entire series' of engagements this spring and summer have put to rest any criticism of slacking, and to those who think the same of the Duke, I recommend reading The Court Circular. I for one now understand why the Duchess vacationed with her family on Mustique, and then went on private holiday with the Duke. I have lived twice as long as they, but I honestly cannot remember if I could have kept pace with them at their age - l lived a very full life, but I rather think not. As you so rightly say, we can never walk truly walk in another's shoes; I for one shall certainly stop my criticism of HRH's eyeliner. Reading everything you've written, I seems beyond horribly trivial, quite vulgar in fact. Thank you for sharing your story and your insight. What a treasure Lady Brody and the other WWII codebreakers are, and how marvelous for the Duchess she had the honour of meeting them. Beautiful comment, Courtney. I also thought your earlier post about the appropriate use of military-style clothing was both thoughtful and illuminating. What a special day it must have been for those ladies to meet Valerie's granddaughter! Wonderful for Kate too. I do wish she had worn something new since we see so little of her but the outfit does fit the occasion. Never a favourite of mine but I'm getting used to it on it's second outing. I'm very excited about visiting Bletchley when we get a chance. My husband has always been fascinated by the code work done during the war but I admit I don't know as much as I should and enjoyed reading about it. Kate surely does bear a strong resemblance to her grandmother. I hadn't really thought about it but agree with whoever said that Pippa is more like her mother. Thanks for doing such a great write-up, Charlotte. Nice blog and what a amazing picture, its really special day for the ladies who meet Valerie's granddaughter. great post ! Bletchley seems to be a very interesting place and I loved the information on Catherines grandmother Valerie and her sister Mary as well as Lady Brody. It must have been very interesting for Catherine to meet her. I loved the outfit especially the blouse. I think her hair looked great. It is one of my favourite looks. I think Catherine looks better than ever. She doesn't have a lot of foundation on, her skin is glowing as far as I'm concerned. Her eyes look lovely and green and stand out with the darker eye make up. Marg--when I put my glasses on--they just MAGNIFY the bags under my eyes! JO- I started itching, just reading about it! Catherine looks gorgeous! I love this complete outfit. This blog has such vital historical information for behind the WW II scenes of British women working for the cause of that war. Kate's grandmother was so beautiful and what a legacy she left for her descendants. Kate looks as if she truly enjoyed this outing in view of her ancestors contributions to the war effort. Her outfit was perfect for this occasion. Charlotte, as I also like the history behind your posts (to say nothing about your posts themselves) I just want to add some real facts behing the Enigma case from Polish Embassy in London fb page. 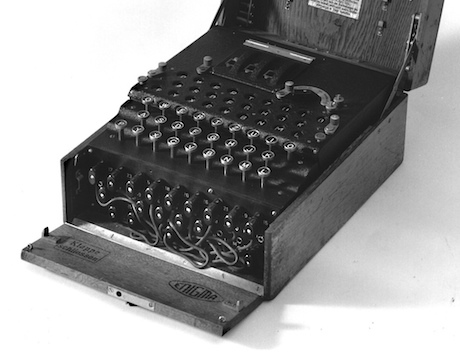 BBC Radio 4 reports from spy chiefs conference in Warsaw on Poland's vital role in breaking Enigma codes.